In Wednesday’s post I wrote about the importance of non-negotiable Self Care practices and why these need to stay on top of our list especially during those times when we feel overwhelmed and stressed out.. Below see the practices that made my Top Five Non Negotiable Self Care Practices that help me stay on top when the going gets tough. 1. Journal writing first thing on the morning is one of the finest ways I know of clearing my head and allowing me that inner space to connect with myself wholeheartedly. I can write anything I want on the page without repercussions. There’s no need to censor what I write and there’s no one looking over my shoulder to judge. It often leads to me feeling better and clearer. 2. One twenty minute walk at least once a week gives me the focus and clarity I need when my mind feels crammed and the to do list feels unmanageable. 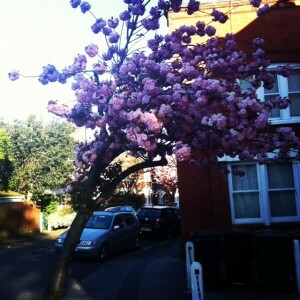 Walking is grounding and a natural way for me to get more present with the moment. When I walk it often takes me very quickly out of my head and puts me into my body. 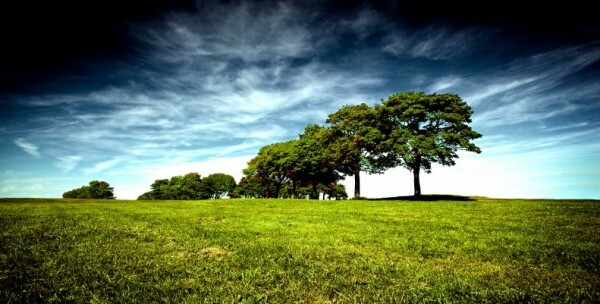 My senses become more fine-tuned and I will become more observant and conscious. When I am more present with the moment then I can step back from what ever is stimulating and engaging the stress to gain new insights and perspectives? Walking I become much more acutely observant of my environment my creativity surges and I move to naturally take photos of what captivates me as I walk. Quite a lot of cross-referencing and free association happens too when I walk. By the end of a twenty-minute walk a knotty problem unravels it’s self and is virtually solved. 3. By having at least one evening off a week no matter how stressed out I maybe from texting or emailing restores my sapping energy. Of course easier said than done but how great it feels when it happens. It’s great to give the mind space to rest from the electronic overload we go through everyday and it’s vital for our health and psychological well-being. 4. Promise yourself at least one early night to get to sleep by 10pm. A few nights ago I broke the remote for the bedroom television set. So now I’m enjoying the space reading in bed and staring at the beautiful lampshade that adorns our ceiling. Sleep is a great stress reliever and will return us to our worked energized and refreshed. 5. Being kind to myself and giving myself permission to meditate for at least 10 minutes each day is like taking a magic pill. I’ve now taken to meditating in-between the gaps in my day. 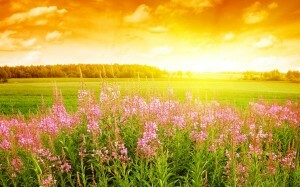 I go about my day consciously taking in long, swirling gasps of deep breaths. It feels like manner for the soul. I find the practices of mindfulness and meditating deeply nourishing and rewarding on so many levels. It leaves me feeling calmer and more focused and provides instant relief. 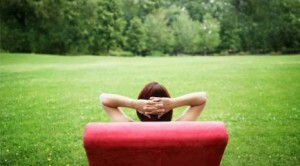 What would go on your list of 5 Non-negotiable self-care practices that would stay in place when the going gets tough? In the post she talks about the requirement for non-negotiable self care. Since reading the post I’ve been thinking a lot about what would go on my own list of non-negotiable self-care practices. When we’re under stress, feeling overwhelmed our self-care practices ate the first to fall by the wayside. But what if our self-care during these times of increased tension and pressure we actually placed more importance and commitment to those self-care practices that support and nourish us as we navigate our way with grace through more stressful times. McMaster is right when she says that these times and practices are just as important as the times we spend in front of the computer or in meetings. What if 5 minutes of meditation rewards you with 50 minutes of fresh thinking throughout your day? In my book Be Your Own Best Life Coach I write about a habit I adopted called Strategic Deceit. This is where if I need a day dedicated to writing I actually write the day as a meeting into my diary. This way when I get a phone call or receive an email asking for a meeting or for some kind of work to be done on that day I can confidently say that I am already booked out. This way I give the same importance to my writing and creative work, as I do to meetings and other forms of the business that often supersede our creative work. Recently on my way to work to deliver a training course I abandoned the crowds of people trying to get down the escalators at Highbury & Islington tube station and decided to walk from the station to the Angel. My walk along Upper Street turned into a wander and I enjoyed drinking in the fresh morning air and the thinking and sensing space that walking freed up in me. By the time I arrived at my destination of the sultry landscape of Kings Cross St Pancras I felt like my body had been given a mental, physic and energetic work over. Walking is on one of my non-negotiable self care practices for this reason. As much as I might resist it or convince myself I don’t have time even a 15 minute walk leaves me feeling replenished in some way. Sipping Jasmine tea at the start of my day gives me a sense of space in what often feels like a crowded day. My morning ritual on the days when I’m not delivering face to face training or have coaching clients booked into the earlier part of the day, is something I really look forward to. The ritual is very simple and consists of a visit to Gail’s Bakery where I order a teapot of Jasmine tea and brown, granary toast with butter and jam. Each visit if possible I sit at the same table. I’m by nature a creature of habit. Even though I advocate the value of different writing spots I find the ritual of sitting at the same table each morning deeply comforting and nurturing. My morning ritual is really an intimate date with my journal a way to meet with my divine self. I’m a seasoned practitioner of writing Morning pages and emptying myself onto the pages of my personal journal. My morning ritual may last for around 20 minutes, sometimes more but somehow the quality of time spent has slowly overtaken the amount of time it takes. No matter how much time we allocate to conscious and mindful self-care, it’s surprising how much more spacious the simple act of writing first thing in the morning in my journal feels. Thanks to a recent newsletter by Mary Reynolds Thompson at Reclaiming The Wild Soul www.ReclaimingTheWildSoul.com I’m taking an Artist date at the end of this week and going to see a photography exhibition by photographer Sebastiao Salgado. 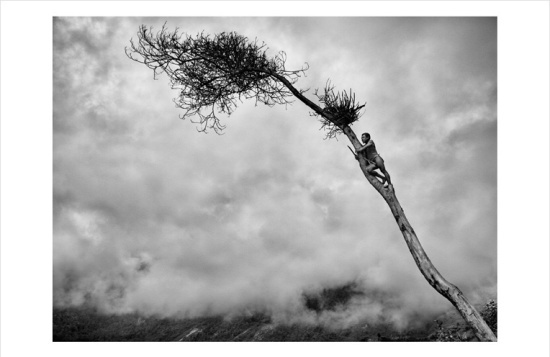 His images of the natural world are deeply haunting and moving encouraging us to reflect on our impact with the natural world and the impact we have on the world’s natural resources. This image of this lone tree was enough to convince me to make a promise to myself to commit to my Artist date and go see the exhibition. The practice of Artist dates advocated by Julia Cameron are a great way to top up our creativity and get us inspired whether you’re a manager, leader, a member of a team. It really doesn’t matter what your role is but artist dates give our mind a vacation from the constant information and technological overload and provide other forms of sensory pleasures. I find that my own creativity gets juiced up when I am exploring outside of my own profession and areas of work a bit like a cross- fertilization process. I find images in particular do a great deal to incite new ideas and perspectives. 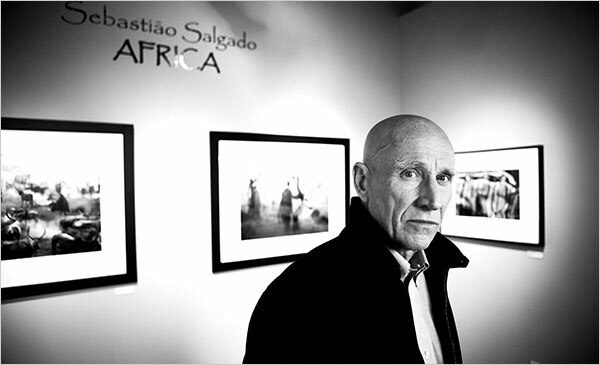 Of course I had no idea why I was fully pulled towards this exhibition but in the process of researching more about Salgado I found out that he has recently planted nearly two million trees on a family farm in Brazil that had been overtaken by modernization of the land. This is a man after my own heart. More on my Artist date to the Genesis exhibition in a future blog post. I write almost every day in some form whether for work or pleasure. But over the years I have established a much-cherished writing practice that has sustained and nourished my work as a writer and author. 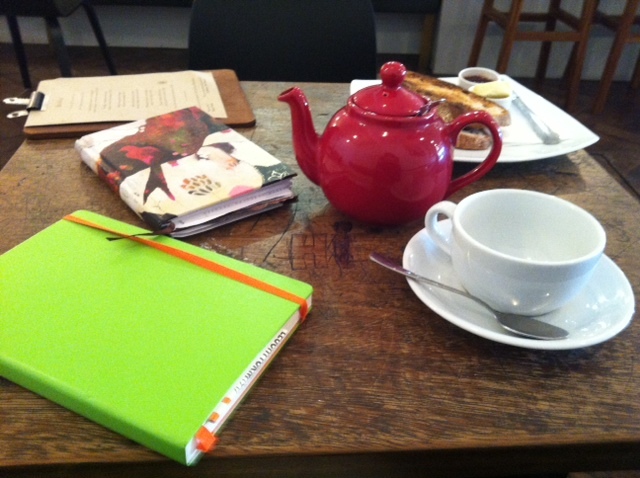 Most mornings when I am not out delivering face to face training courses I will head off to one of my local cafés, Gail’s Bakery in West Dulwich and order a pot of Jasmine tea with some toast and jam and start writing. I normally start by emptying myself onto the page in a practice I have been doing for over twenty years now, Morning pages. Morning pages are three pages of fast writing without editing or censoring your thoughts onto the page. This is a great way to off load many concerns, worries, anxieties onto the page in a safe and constructive way. I often feel clearer, more focused and grounded once I have completed my early Morning pages and this gives way for me to be creative in other ways on the page. Once all of the angst and worries are out of my head it then makes space for more healthier thoughts and ideas to come to the forefront. The practice of writing Morning Pages makes it easier to access my creative data, which can often get buried under all the other stuff that fills up the space in our heads. For example I might get an idea for a blog post, recall something I read about earlier and make a note to follow it up or come up with ideas for a new exercise for a training course. 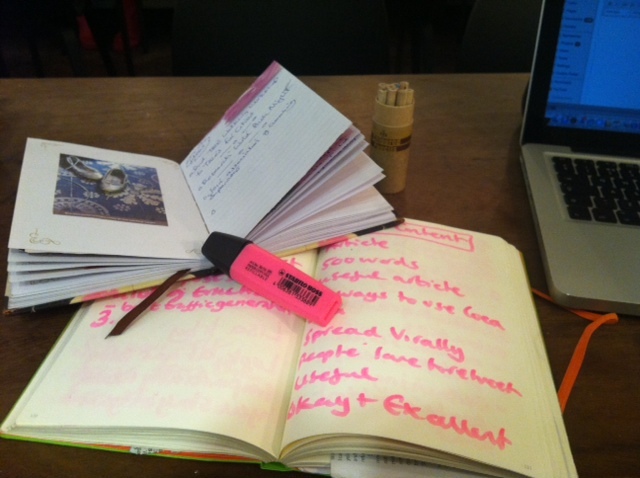 Writing in this way I also helps and guides me to streamline my list of things to do for the day. It seems that once I get my things to do list down on a page I feel more in control of how I will approach and go about my day. Many ideas for posts for my blog have emerged from the daily practice of my Morning pages including the content for articles and even chapters for books I’ve written. My journals have also been home to the space where I have steadily cultivated my writing voice and gained more confidence in my writing ability. I value my journal for many reasons, most of all as it is the where I can be more of myself without expectations or judgments from others. It’s where I don’t have to explain, where I can off load and make sense. Since completing Susannah Conway’s Journal Your Life online course www.susannahconway.com I now have a Business Journal. Where as in the past all ideas for my business would be included in and amongst my personal musings in my journal I now have a bright green Leuchtturm journal where I plant all of my ideas in luminous pink. Having this journal has made a big difference the manifestation of many of my ideas for my business. I feel far more organized about my business and creative ideas. I am inspired each time I open the pages. It feels like a place where my business thrives and where I can easily see the progress I am making. The journal feels playful and engaging to work with and I love opening it’s pages and flicking through ideas, which turn into projects and articles. When I am out delivering face-to-face courses I write in between the gaps and cracks of my day. Taking the Over ground train from my local station often lends itself to at least twenty minutes where I can use the journey to write my Morning pages. I find it easy to cocoon myself in a bubble and get lost on the page surrounded by already weary morning travelers. I find this is an excellent way to unravel myself graciously into my day. I feel a better person when I look up from the pages. I am more alert and more attentive to myself, and everything around me. I see writing Morning pages as a kind of tuning in. In the evenings if I am not home too late I love to head for my local library. Once the students have finished revising for their exams our local library becomes a quiet haven and sanctuary where I can retreat to and be creatively inspired. 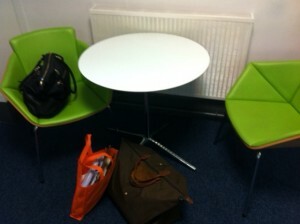 An hour spent in my local library at the end of a busy day can amount to 3-4 hours of quality work. I will often create a new to do list for the next day, finish a task that I have been procrastinating in a 30-minute block or start writing something I have been avoiding. On the days when I am working from home and not coaching I will retreat on all day writing marathons to my favourite spot in my local library. I’m obsessed with securing the same writing spot that I’ll queue in front of the library doors ten or sometimes fifteen minutes earlier before the doors open. There’s something anchoring about settling down into my favourite spot, which sends out the signals to myself of my clear intention to write. My family think I’m weird because I don’t seem to turn off as a writer. On the days when I’m relaxing these are often the days when grand ideas come to me. So wherever I go I’m never without some kind of instrument to write things down in whether it’s a notebook, journal or my iphone. I remember many years ago reading a story by Paul Auster the novelist as a child meeting by chance his favourite baseball champion after a game and asking for his autograph and then being mortified as he didn’t have a pencil or a pen and neither did his hero. Why would we want to miss an opportunity of capturing the creative download that occurs constantly throughout our days? One of the things I recognize is that the same creative ideas are dispersed to hundreds even thousands of people at the same time across the globe. What makes a difference is who acts on what. So the first part of taking action is to record the ideas somewhere where they won’t be forgotten. Here’s your task for today. If you don’t have a notebook then your task today is to buy yourself a notebook or set yourself up with a Notes App on your iphone or Smart phone. Set aside ten minutes every day where you write as fast as you can any thoughts or ideas that are in your head. Pull out your notebook whenever an idea or thought comes to you. Look back over your week’s notes and recordings. 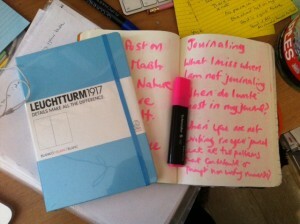 Ask yourself what difference has working with a notebook or journal made to you and your work? This quote from Living Our Values expresses wholeheartedly the essence of what I was wanting to communicate in the previous blog post. When we activate and find ways of bringing our values alive the impact is remarkable. 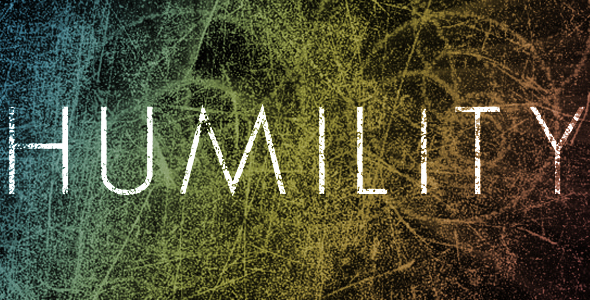 How often will words shared and expressed through the value of humility make a difference? What are your thoughts and feelings about the above quote? Have you began answering any of the questions from the previous blog posts? 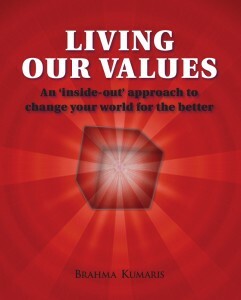 Last week I was a panel member at the launch of a very important book Living Our Values: An ‘inside-out’ approach to change your world for the better, published by the Brahma Kumaris in the presence of Dadi Janki the 97 year old Spiritual head of the Brahma Kumaris. I’ve been working with the Brahma Kumaris for the last five years and have loved every moment of presenting and contributing to a few of the many projects facilitated by the Brahma Kumaris including, The Spirit of Coaching and Living With Cancer, workshops, retreats and seminars. 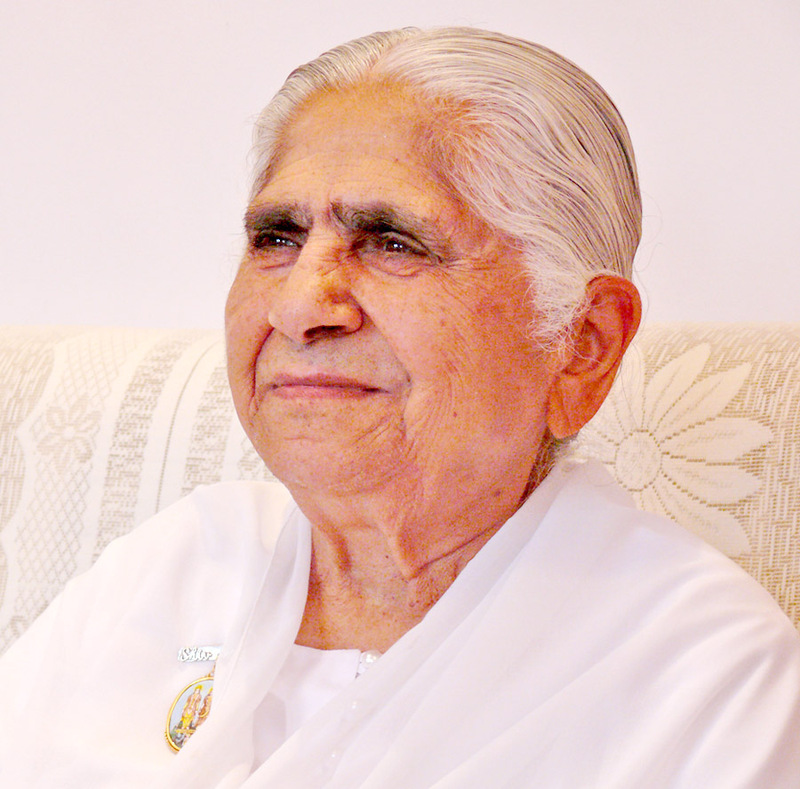 My time working with the BK’s is voluntary but I feel that I am very well paid as I always leave with such wisdom and internal guidance for my own spiritual and emotional development. There’s so much about what the BK teaches that overlaps with the work of coaches and today I want to highlight the common area that both approaches share which is that of Values. When I read this opening quote it really caused me to pause and reflect in a meaningful way, revealing an Inquiry question, the type of question that Coach Patrick Williams in his book, How To Become A Professional Life Coach, suggests we offer our clients as a way of deeper inquiry. I immediately connected with how spending time exploring our values allows us to show up and to express more of our authentic selves. When we make those connections to our values we are more able to communicate and connect with others particularly in times of conflict and difficulties. For example one of my core values is respect. So when I am able to be consciously aware of this value as I go about my day-to-day business it means I am consciously choosing and responding to others from this base line of respect and value. When I am not connected to this value my communication and responses may be snappy and harsh, not thought through or defensive. 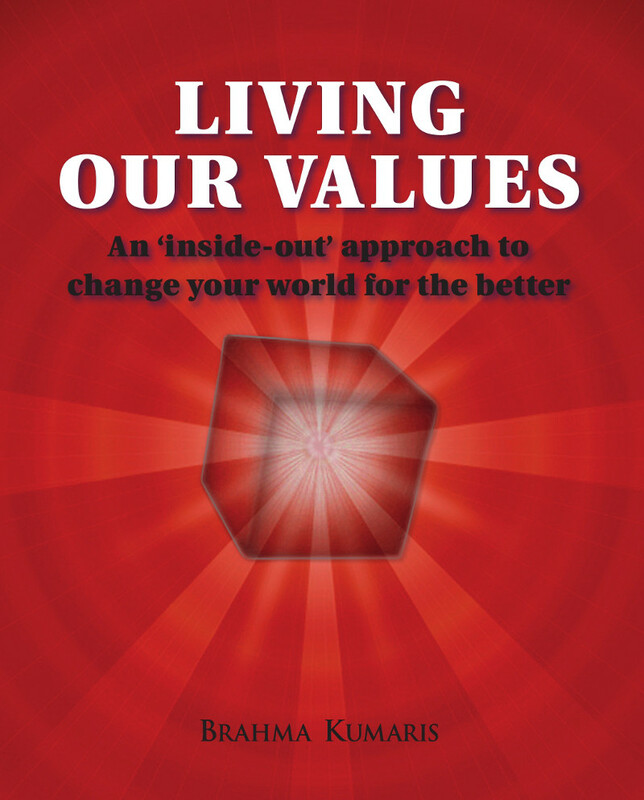 Values and our conscious connection to our values in the present moment changes how we express ourselves and who we are in any given moment. Take any value and you will find that once consciously embodied, expressed or even acknowledged you will experience more of the person, you will feel them and sense them. What is your most important value? What value do you believe the world needs most at this time? These are questions that can be included on a Coaching Joining form sent to your new clients before your ever first coaching session. How wonderful to dive into the beautiful deep ocean of the expansive possibility of who people really are and find out what really feeds their core through engaging in a dialogue about personal values. Even more importantly as coaches we can and must answer these questions about values for ourselves. We cannot expect these questions to be answered until we are brave enough to dive in and answer them for ourselves. On the panel I used the metaphor of the tree’s root as a reflection of how our core values feed our behaviours, our thoughts, our action, or well-being or un-well being. Too often we dive into our work superficially without wanting to unravel these deeper driving forces. By bringing values into the forefront and exploring how we are expressing these core values in our work, in our relationships in our meetings and encounters with the public and with strangers many issues and problems will be gracefully dissolved. Reflecting on what value was and is most important to me right now in my life I realise that it is the value of respect. I experience this value being sadly neglected in so many ways in organizations. Change brings with it a season of emotionality and we as individuals and a collective are notoriously poor at increasing the quantities of respect we heap onto others as they go through turbulent and difficult times. It seems easier to go against our values and walk someone through the life changing experience of redundancies than to express the values that we hold dear somewhere deep inside but we find hard to express. It is easier to be distant, even aloof than to find the many way we can express our respect and still maintain boundaries and professionalism. A good way of addressing this is to work through the practical exercises outlined in Living Our Values. Taking a notebook and setting aside 30 minutes will give even the faint hearted an opportunity to begin to stoke the fire around what values mean to them and to recommit to ways in which their values can be shared more explicitly in all that they do. Here’s one of the practical exercise you will find in the points for reflection at the end of the chapter on Respect. 1. What does respect mean for you? 2. Think of someone who is an inspiring example of respect. What makes them so special? What are the secrets of their success? 3. In what ways do you demonstrate respect for yourself, for others and for nature? 4. Are there any areas in your life where you would like to be more respectful? 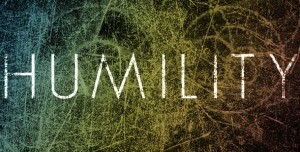 What discourages you or prevents you from doing this? 5. How could you develop the value of respect in your life? I have been thinking a lot about the many conversations I have with individuals I coach, teams I work with and coaches I train. No matter what our roles and positions everyone seems to be afflicted with a constant busyness and overwhelming list of tasks and things to do, myself included. But the one thing that allows me to bring my whole self and sanity back into my work is a fundamental belief in mindfulness, engagement in a reflective and creative practice on a regular basis and a deep sense of meaning and purpose that I draw from my spiritual path and beliefs. Our preoccupation with the past and the future and what could, and notice the emphasis on could, erodes our ability to be aware and fully present in the here and now. It shuts off our innate ability to draw on an arsenal of resourcefulness and creativity. A lack of mindfulness shuts us down to our best thinking. Just think about how much is missed when we are constantly pre-occupied with being elsewhere in bodies and in our minds. I find this preoccupation happens a lot with coaches whether experienced or new to coaching. It’s so easy to fall back into the trap of getting caught up with the voices in our heads which vocalize thoughts and feelings based on past experience, usually negative or unconstructive dialogues or they become tangled or muddled with future thinking about what or how we think we should or shouldn’t be performing. All of which dulls the quality of our attention and awareness on the person we happen to be working with. One could suggest we are mere shadows of ourselves when we work from a lack of mindfulness awareness. Speaking on a video about mindfulness from the School Of Life, Professor Mark Williams read the above poem by R. S. Thomas. 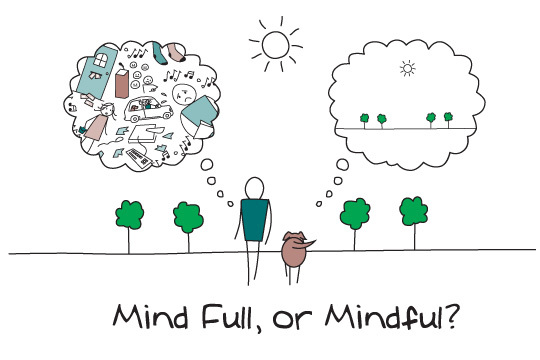 Mindfulness is important for all parts of our life from work to the personal. When we allow our thoughts to rob us of the goodness of a moment, any moment, whether it is stealing us away from the taste and sensory experience of the food we are eating, to the experience of really receiving the person we just brushed past without really looking at to not really listening and being present in the conversation we are having, we are shutting ourselves down to so much of what is alive and vital in the moment ad inside of us. How much is missed we can ask ourselves? Automatic pilot does not get more done, although many of fall into the trap of believing that it does. In fact research has shown it lessens the effectiveness of our ability to be creative. In my mind that means it impacts on the quality of our decisions, the quality of how we manage and lead. It impacts on so many layers of our personal and professional lives. In the training of coaches I am engaged in we make a real effort to encourage coaches to integrate a reflective and mindful presence in their work as coaches and beyond the role of the coach both at work and at home. I am always encouraged when managers and leaders participating in some form of coaching training say how much a difference coaching is also making in their personal and family lives. Of course we teach coaches the models and tools required but in the same breadth we invite them to lay down the tools and techniques when required and do what the therapist, Irvin Yalow was quoted as saying. “Technique is what you use until the therapist arrives,” So often coaches new to coaching will hold on tightly to techniques but as Yalom says we will no longer require holding onto the techniques as much when we fully arrive and are present in the moment with both ourselves and the coachee. Try these simple mindfulness techniques, which will attune the quality of your awareness and ability to be more engaged and mindful throughout your day. These techniques can be used before, after or during your coaching sessions when your awareness wanders, you become distracted or preoccupied or you simply want to improve your mindfulness capabilities. Focus on your breath for one minute. Focus on the rise and the fall of the breath even in the event of lots of thoughts flooding the mind. Choose an object that is visible right now in the space you are in. Put your focus and attention on the object for one minute. Once the minute is up continue mindfully observing as long as you are able to. 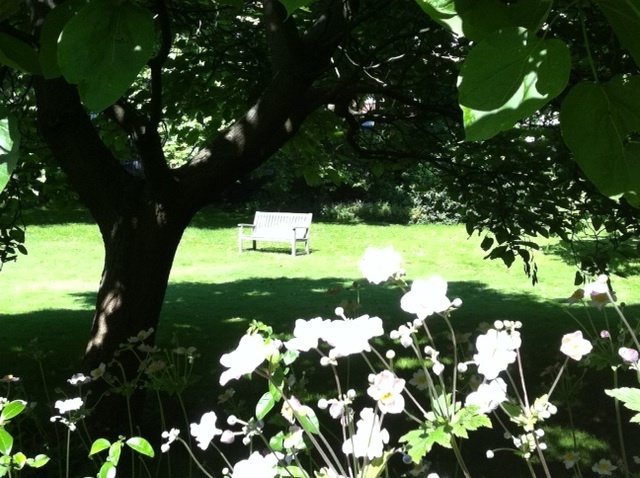 Take 5 minutes in-between a meeting or a conversation and daydream. Focus your attention or awareness outside a window, close your eyes or stare into space. Choose one of your daily meals and eat it as mindfully as you can. Before you taste anything on your plate, take in the colours and the smells. Get curious about where the food came from. What does the aroma’s of the food remind you of? If there is no smell imagine what the smell should be like. Take tiny bites and savour the food on your tongue so you can accentuate and stimulate those taste buds. Take 5 minutes to carry out a mindful body scan. Close your eyes and relax your breathing. Make sure you are standing or sitting comfortably. Give yourself permission o do nothing with your emotions or feelings except to notice them. Starting at the base of your feet talk yourself through a mindful body scan of each region of the body. Move your awareness from the soles of your feet, up your legs and thighs and so on until you reach the crown of your head. When you have arrived at the top of the head take three deep breaths and rest quietly and just notice how you feel. This mindfulness practice will bring you more physically and mindfully into your body. Try before a coaching session. 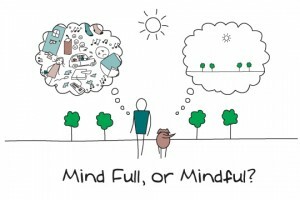 What activities help move you into a mindful state? 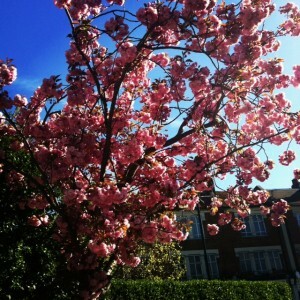 I am loving feasting on the many Cherry Blossom trees that are around at this time of the year. My iphone camera is happy. I’ve fallen in love again. It happens once a year normally between the months of mid March to mid April but the dates do move. 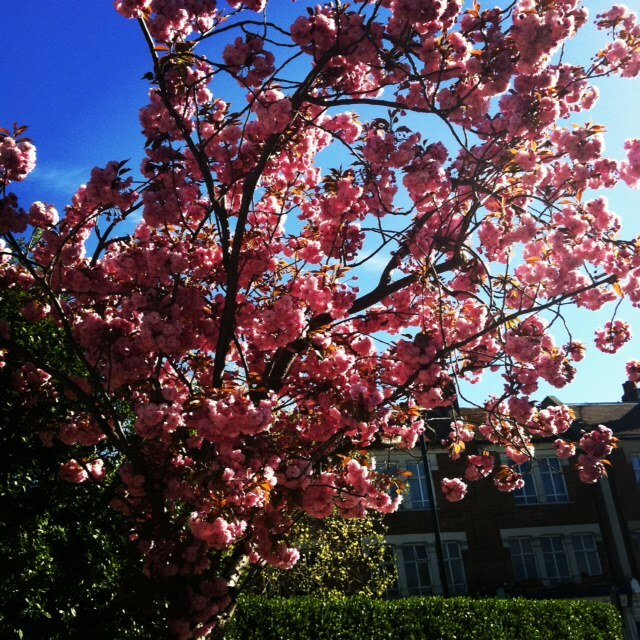 This year I have been fortunate to witness the once a year weekly, sometimes stretching as far as two weeks bloom of the magnificent Cherry Blossom trees This year the bloom has fallen in my birthday month of May. This year the bloom is late causing concern perhaps more for the environmentally conscious about the state of our weather. Yet at the same time giving our eyes a treat after the sluggish weather conditions of the last few months. In the ancient cultures of Japan the blossoming of the Cherry Blossoms were used to forecast how crops for the coming year would do. So make of that what you will. I wonder how this later bloom will impact on the state of the crops and harvest for this year? I woke up this morning determined to capture some shots of the Cherry Blossoms before their delightful blooms disappear from our landscape over the next few days for another year. So I set myself a creative expedition of going on a short savour safari. The idea of a savour safari is to really drink in your chosen object through as many of the senses as possible. Savouring is different to a glance. A glance bounces on and off in a jiffy. It’s a slowing down in the absence of rushing. It’s about taking time to be with the moment, your object, food or a person rather than rushing your way past or through. I believe that savour is a word we need to reclaim in our busy, hectic lives. We do not savour enough in our modern world and I am determined to readdress this balance, starting with myself. 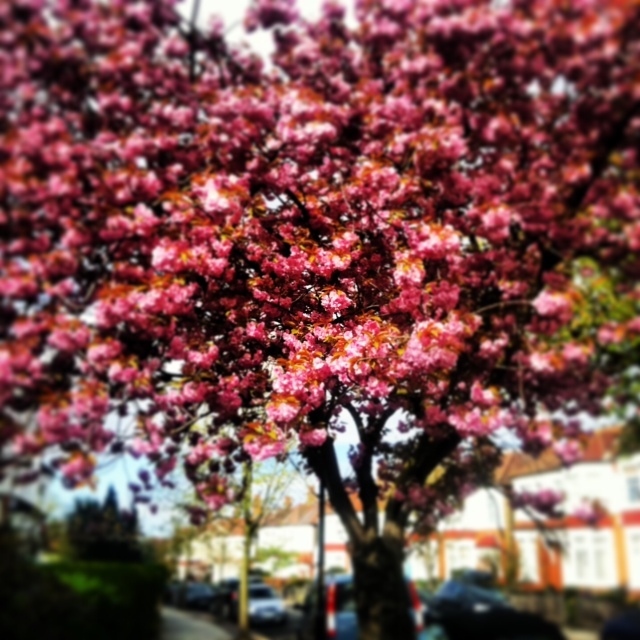 So what I did this morning before I started out on the emails was to hop into my car and take a short tour of my local area snapping images of as many Cherry Blossom trees that have birthed their clusters of pink fuchsia, white almond and rust oranges clusters of flower petals in my local neighbourhood. My morning trip was a delight. Cherry Blossoms were bursting out everywhere. There was no holding back from these trees, which for the other eleven months of the year could be so easily looked over. I found them on street corners, bursting out from behind fences in back and front gardens, on roundabouts and pedestrian crossings. Of course I cannot taste the Cherry Blossoms trees around me and the smell of the Cherry Blossom’s fragrance seems to have been dispersed in our toxic air. So today my savouring is fuelled by sight and the feelings, sensations and memories that are evoked when I am around these trees. 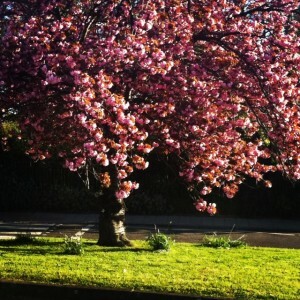 After my photo expedition I made time to journal and I’m surprised by what surfaces on the page, memories and desires of being married in an orchard of Cherry blossom trees. 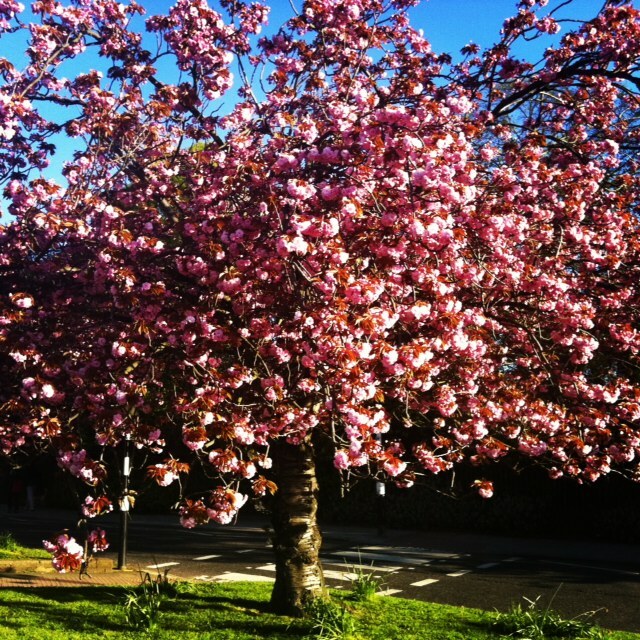 An Internet search shortly afterwards reveals that the most globally requested destination to be married is under a Cherry Blossom tree. 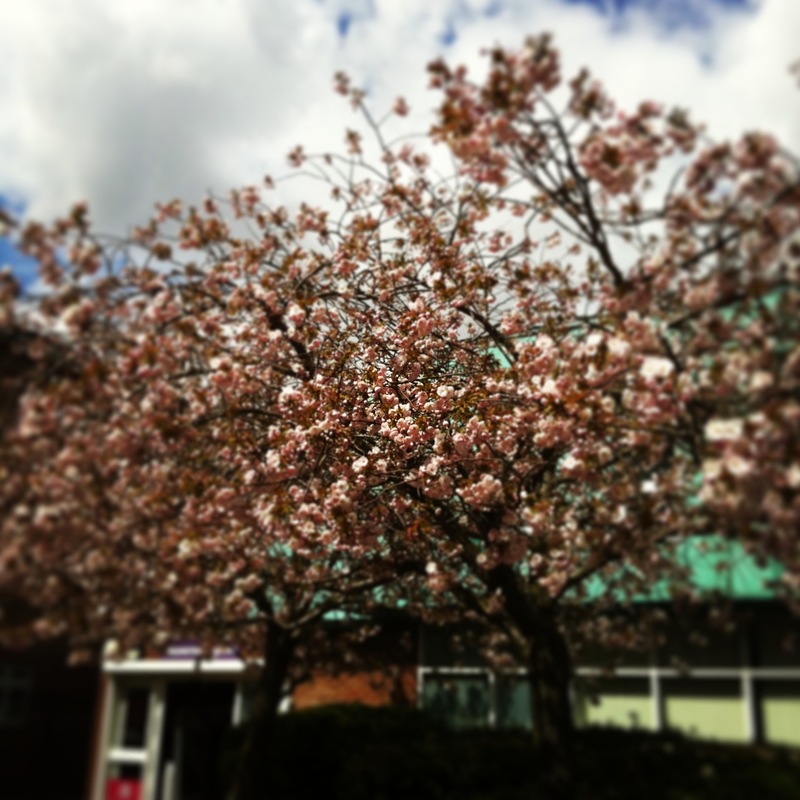 Enjoy my personal gallery of the Cherry Blossoms captured on my iphone this morning and one of a Cherry Blossom I snapped on a trip to Colchester this week for work. 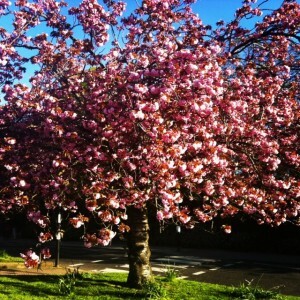 These images will keep me going for another year until the Bloom of the Cherry Blossom returns next spring. I’d love to see some of your images of the Cherry Blossom tree in your areas or from your travels. Just email copies to: jackeeholder@aol.com and I will post your images on the blog. 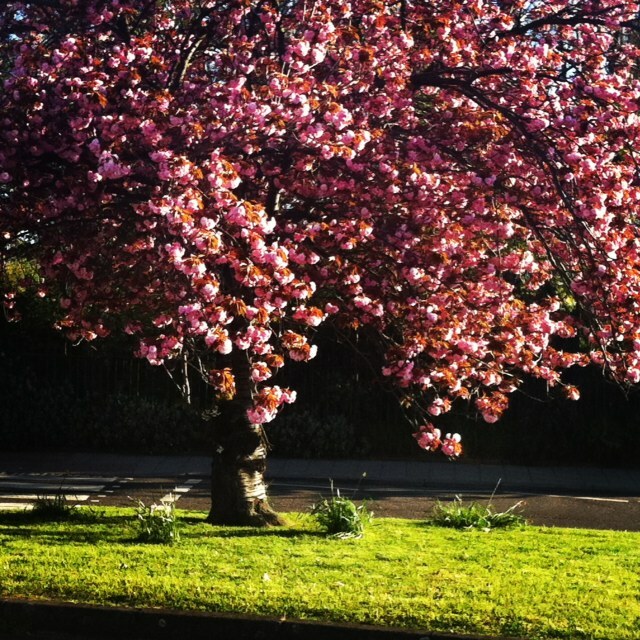 Let us know the site of your Cherry Blossom and date of your Blossom Patrol.